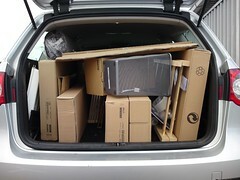 My daughter and I stood waiting for my husband to back our rented cargo van into the loading space in the IKEA parking lot. On our store cart sat a box spring and mattress for a queen-size bed plus 18 cardboard boxes whose contents contained my daughter’s yet-to-be assembled bedroom set which we were going to move into her new apartment. I’m not sure why my husband, daughter and I thought we could handle this move on our own, but we were wrong. However, let me say in our defense that we were not naïve. We had four years of moving her into college apartments under our belt, but for this move, we needed Superman or at least two guys on a steroid overload. After my husband backed up the van, I opened the rear doors. Already inside the van was a sofa that my brother had donated for my daughter’s new digs. I looked at the full cart, and I looked inside the van, and I knew we were in trouble. The box spring was first to go into the van and that was not bad. The problems started when we attempted to maneuver the mattress into the van. We pushed the mattress half-way in, but it would go no further. In the front cab, my daughter and my husband pulled the mattress toward them. I pushed the mattress from my location inside the van where I was sandwiched between the box spring, sofa and mattress. Since I was underneath the mattress, I was not aware that shoppers had gathered to watch this performance. “Push! Just a little more!” my husband yelled. “I am pushing! I’m pushing as hard as I can,” I groaned in a very loud voice. “No, I don’t think we are that bad off. We’re okay,” I gasped. Disappointed that no new baby named IKEA had arrived on the scene, the crowd dispersed and we moved on to our next phase of labor and delivery. Lesson learned: Next time she moves, we hire professionals or at least an OB/GYN. This is an essay from my new book Try and Avoid the Speed Bumps . I figured it was safe to publish it here now too. I laughed lots and have just found my newest, favorite Donna post. Can I please change ‘me’ for ‘my’ in that last comment and pretend it never happened? Cheers! And by magic it is gone! HA HA Glad you enjoyed it Mr. Ledden. And it is totally true. Thanks so much. It means a lot coming from a moving professional. Next time, we are calling you. Are you in Philly area? Ikea, apartments, and parenting can be hilarious, especially when Donna shares her perspective. My wife gave me her copy of this to read after I kept asking what she was laughing at. I have to tell you I laughed a lot. For anyone interested, this excerpt is very representative of the whole book. Thanks Ted. I appreciate the nice review.